Mother Anne M. White, a long standing member of First AME Church, Oakland, CA, passed on Saturday August 4, 2012, at her home. Mother White was the Mother of the Rev. Dr. Carey G. Anderson, Pastor of First AME Church, Seattle, WA. She was a Life Member of the WMS and the Lay Organization in the California Conference and had been elected a delegate to the General Conference from 1980 to 2000. 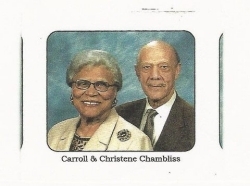 Funeral services will be held at First AME Church, Oakland, CA, on Tuesday August 14, 2012 at 11am. Her Pastor, the Rev. Dr. Harold R. Mayberry will delivery the Eulogy and officiate over the service. Remember the family in your prayers. Rev. Terri Strong graduated on May 18, 2012 with a Master's of Divinity from Payne Theological Seminary. Rev. Strong is an Itinerant Elder in the 13th Episcopal District. Rev. 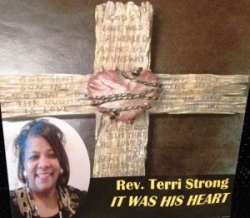 Strong also has a gospel CD entitled "It Was His Heart" available on cdbaby.com, itunes, spotify,amazon.com, and terristrong.org. Rev. Strong has two publications for youth and young adults and those young at heart entitled "Wee Wisdom" and Inspiration for Life's Journey" available at authorhouse.com, amazon.com and terristrong.org. We are blessed to celebrate the 90th birthday of Rev. Robert Kirk, Sr., retired Presiding Elder of the Indiana South District, June 11th. He is the father of Rev. Barbara L. Harris, pastor of Bethel Richmond,IN and Rev. Robert Kirk Jr, ministerial staff member at St. Phillip AME Church, Atlanta, GA. To God be the Glory! 05-07-2012 30:15 Greetings, Allow me to on behalf of my cousin Sean Pillay and the family to extend a word of thanks to all those who took the time to write a note of support /call or send an sms message to our family during our time of bereavement. Men of our Zion like retired Elder Alton Paris just dropping a simple note: thinking of you and your family - making a world of difference during our time of challenge when death entered suddenly. Bishops and General Officers not being too busy to extend a word of support. It is gestures like these that that conveys a message that "your labour is not in vain". Times without number I have sent information regarding our Zion as my contribution in keeping he banner of Christianity and African Methodism flying high. Response like these only encourage the effort to keep on keeping on, someone IS listening, someone IS reading and most important of all, someone cares and appreciate the little we do Stay blessed and keep on loving. 09-30-2011 1:15:42 AM CST My Sisters and Brothers in the Connectional Church, On the behalf of the family of MSGT Gwendolyn Ashley, we thank you for your expressions of encouragement, concern, love and support in the passing of our sister. Your calls and card that are still coming are comforting. Be assured that your contributions of spiritual and emotional support are greatly appreciated and will be remembered by all of us as we adjust to Gwen's absence. God bless and keep each of you is our prayer! Bettye McGlockton, elderest sister of Ms. Ashley. 12-29-2010 6:44:41 PM CST The family of the late Mrs. Alma E. Starks gratefully appreciates the loving outpouring of sympathies and condolences. Please keep us in prayer.